Always look where you are going, especially on the roadway or you might end up in a crack like this cyclist in Wisconsin. 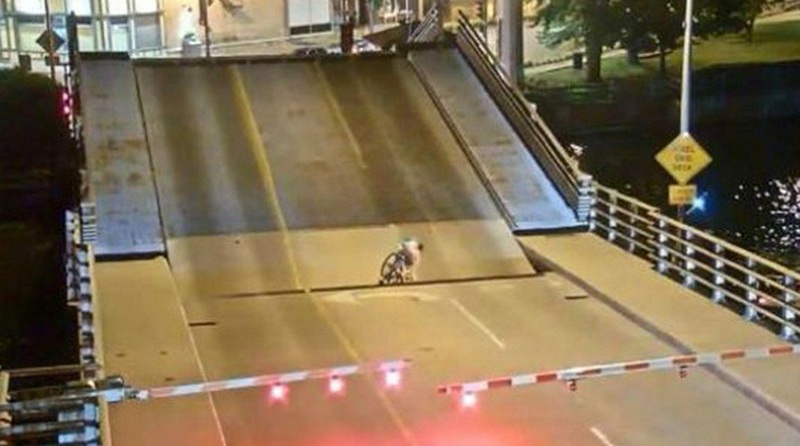 Wisconsin Department of Transportation released tense video of a cyclist ignoring the flashing warning lights of a drawbridge and continuing past the barrier. The 37-year-old woman then keeps riding straight into a widening crevice in the bridge as it continues to go up. Bystanders rushed to her aid and she was taken to a hospital and treated for injuries to her face. The event took place on July 4 in Menasha, Wisconsin and nearly cost the cyclist her life. Warning lights flashed as the woman weaved past waiting cars to get to the bridge was rising to let a boat through. The cyclist rides right into the gap and disappears from view in what appears to be a fatal accident. Luckily, bystanders helped the woman out before she was crushed by the concrete drawbridge. He'll lose if the city uses just the 1st 4 seconds of the video.